We had not planned to visit the Navajo National Monument, but when we saw a sign for it on our way to Four Corners and Mesa Verde we decided to stop. It ended up being a worthwhile detour, although we only saw the visitor's center. Of course, it was also nice to add stamps to our National Park Passports, especially since they had the 25th Anniversary of the National Park Passport stamp. 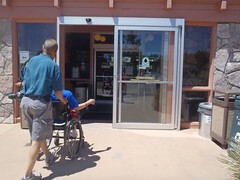 The visitor's center at the Navajo National Monument has an automatic door, which Mik liked because he did not even have to push a button to open it. Inside the visitor center is a small exhibit about the Native Americans in the region. It includes a replica of the house structures that even Mik could roll into, although there was barely enough room for him to fit. 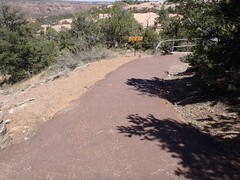 Outside the visitor's center is the Sandal Trail, which is paved and takes you to an overlook to see the cliff dwellings. The trail is accessible, but Mik was freaked how close it was to the edge of the mountain even though there appeared to at least be a railing on the edge. Also, we still had a lot of driving to do that day, so we did not go on it. Near the trail there is a little area set up with an example hogan dwelling. The paved path ends right on the edge of this area, but it really is not much to see by getting closer. Thus you do not really miss out if you cannot go in the dirt path. Overall Navajo National Monument impressed us. 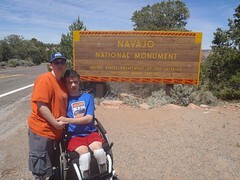 We did not do the accessible trail, but it was great that there was an option.